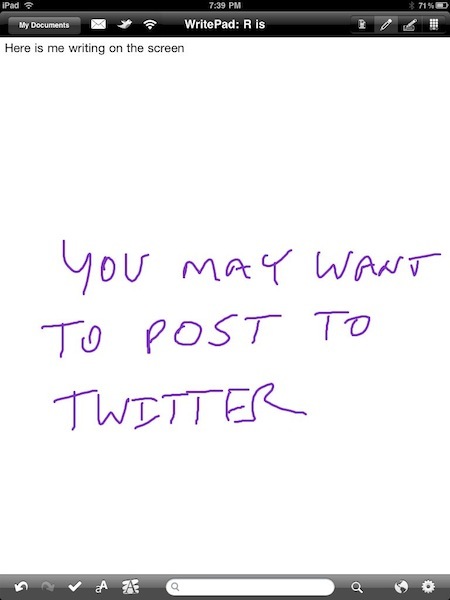 Getting handwriting recognition right is hard. As we have mentioned before, it is impossible (with current technology) to get it right 100% of the time. So, the trick is how quickly and easily can you correct any spelling issues. We have recently been posting articles on how we make the best use of Note Taker which leaves your handwriting as eInk exactly as you write it. 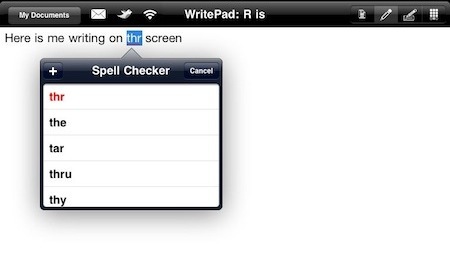 WritePad is a full featured HWR app so what you write becomes text which is editable and shared. The strength of this app is that ‘write anywhere’ feature though. You can switch back and forth all in the same documents vie the two writing icons in the upper right corner of the screen. A cool feature that seems to get very little press is the ability to change the background and text to a wide range of colors. It isn’t just lines on white or colored paper… you can have green text on black background if that is how your used to keeping your attention on your work. Correcting can be done a word at a time or the whole page can be checked at once. 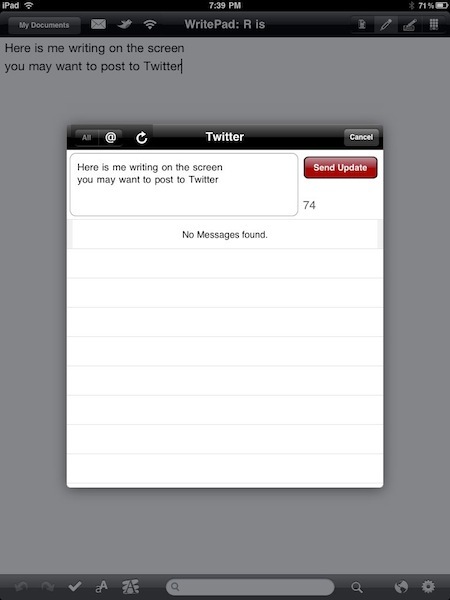 You can then correct from a pull down, letter by letter or remove the word completely. You can continue to write from where you left off or insert in where you currently have text. 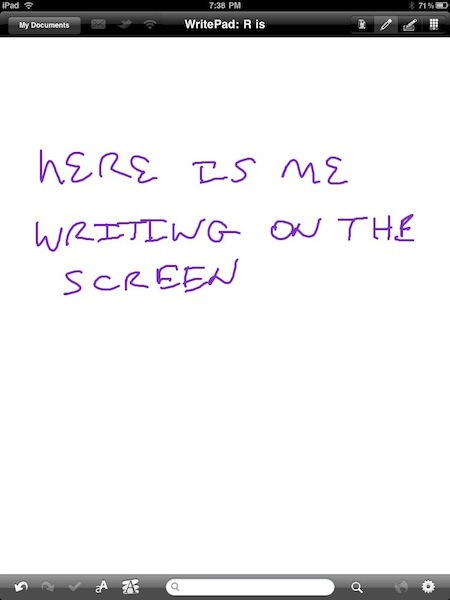 Handwriting works in both portrait tall and landscape wide view. 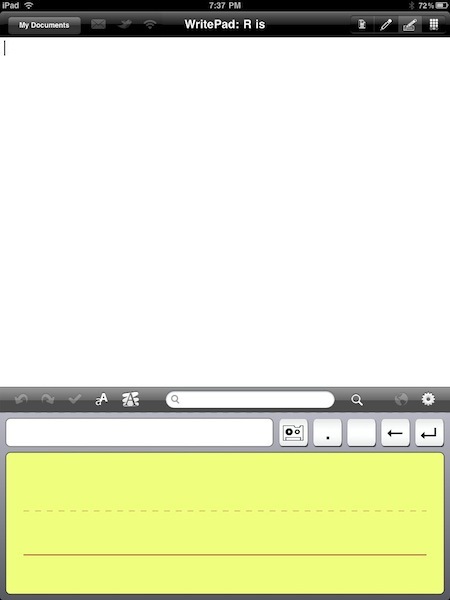 The new ‘big’ feature in this week’s update of WritePad is it’s ability to quickly push your note out to Twitter. The push to Twitter is accessed through the new little bird icon along the top button. Different situations require different apps. When we type, we generally use Evernote, need to write notes for ourselves or sharing with a controled group we use Note Taker and then WritePad when we know we want to write but have the need to share text.